For those who have a garden, particularly one that might be considered a fairy garden, it isn’t complete without the traditional wreath. 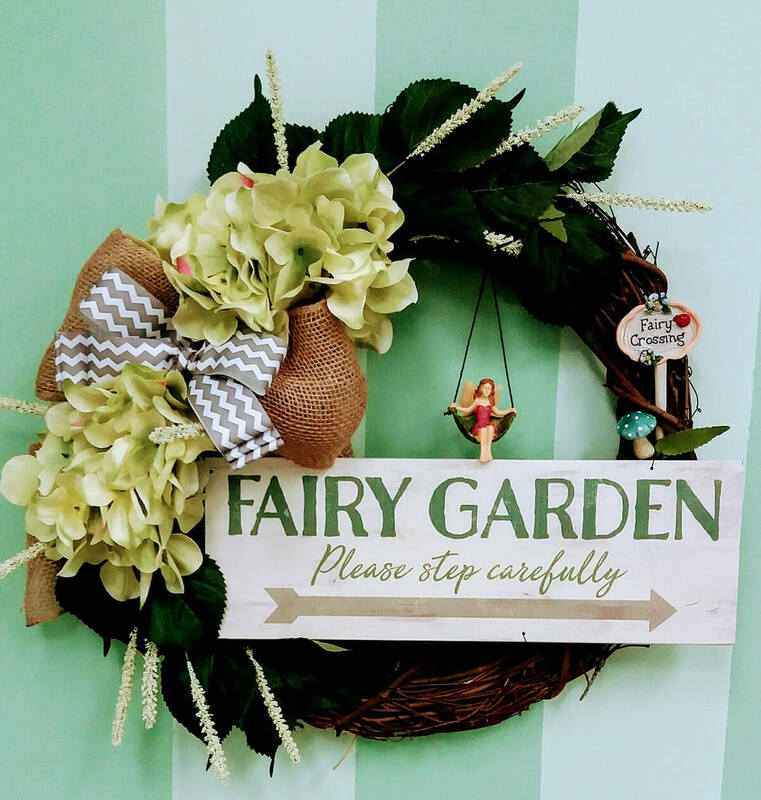 When all is said and done, you’ve planted the flowers and bushes that can make your fairy garden come to life, the perfect remaining detail you can add to welcome those woodland creatures and animals to the garden is through a fairy wreath. Traditionally, wreaths are used as beacons of welcome. 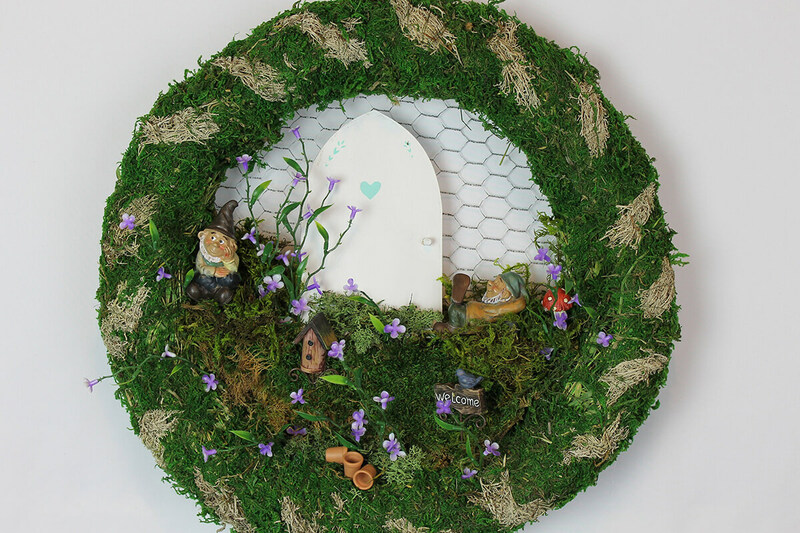 One of the most exciting things about a wreath for fairy gardens is that it allows your imagination to run wild. 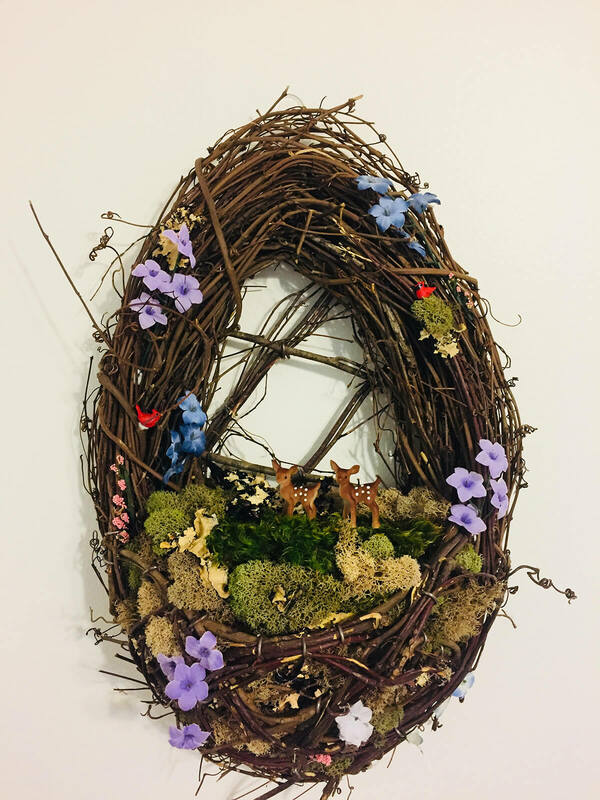 While there are certainly common motifs that are traditional in fairy gardens, at the end of the day, you can have a lot of fun adding in fun little creatures, items, and toadstools to make your wreath perfect and, let’s be honest, adorable. 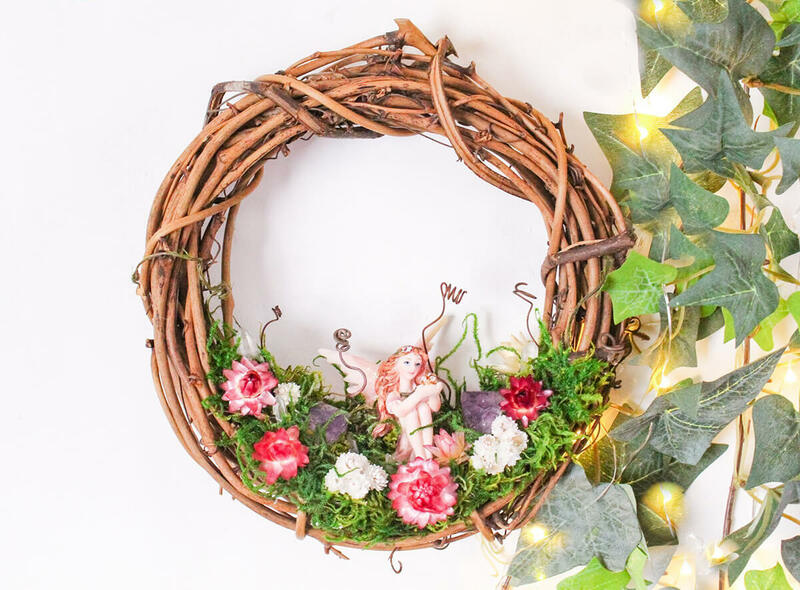 This article will offer you 18 ideas to make the perfect wreath for your fairy garden and to welcome guests to your home. 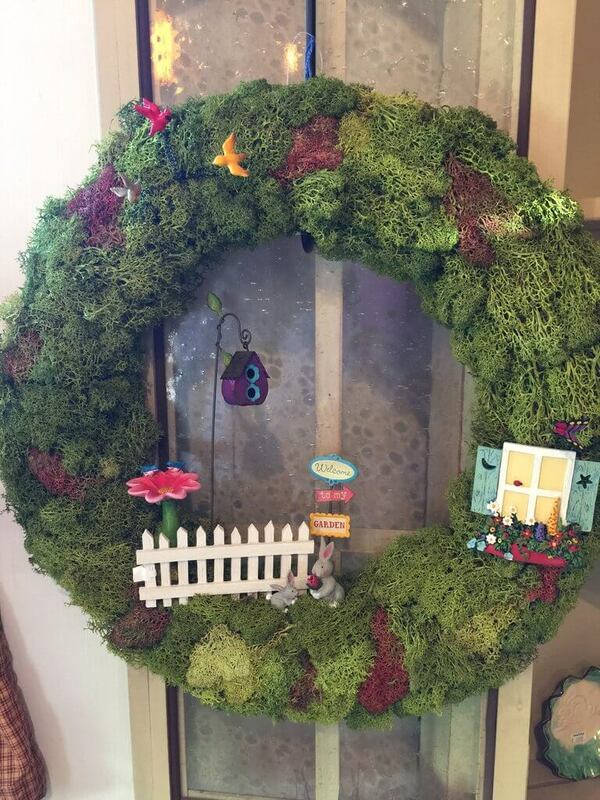 This adorable fairy garden wreath displays a bountiful mossy garden wrapped in wreath-shape. 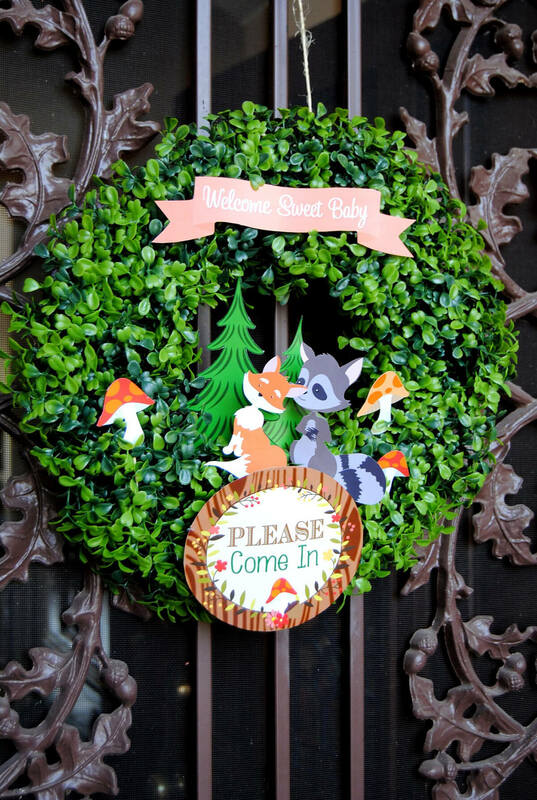 A cute climbing ladder welcomes little fairies and playful gnomes to join the deer at play within the wreath. There are other little items making a home in this wreath as well like toadstools, flowers, and even a happy snail. This wreath provides a warm welcome. No fairy garden is complete without the use of gnomes. 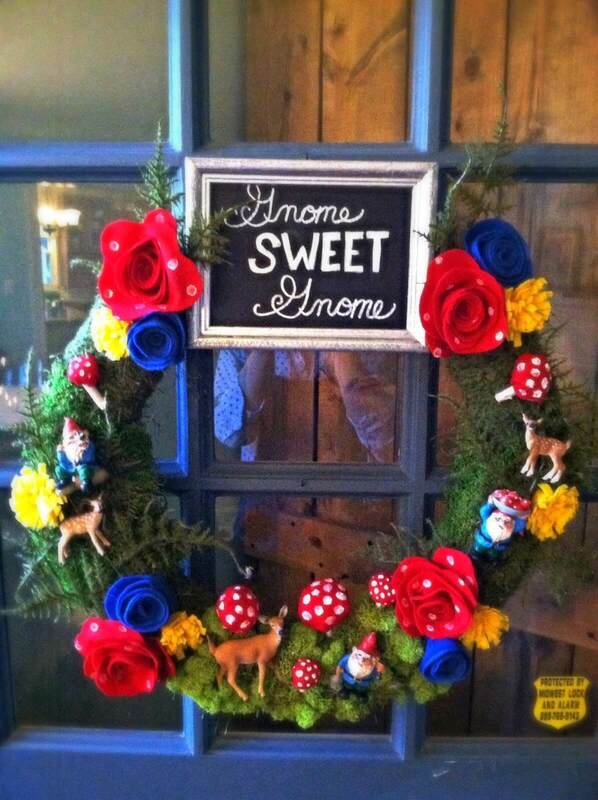 This wreath provides a fun display of gnomes and their famous toadstools. Little deer also nestle within the wreath which gives the decoration a suggestion of innocence. Most importantly, a chalkboard sign rests atop the wreath to greet your guests as they come to your door. Everyone loves a good pun. 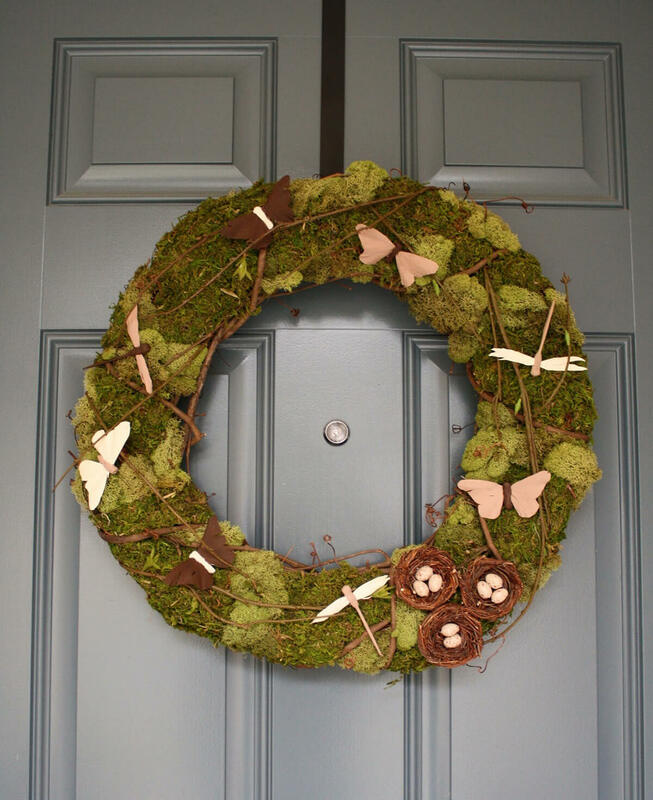 A beautiful display that invokes feelings of whimsy and peace is this butterfly laden wreath. 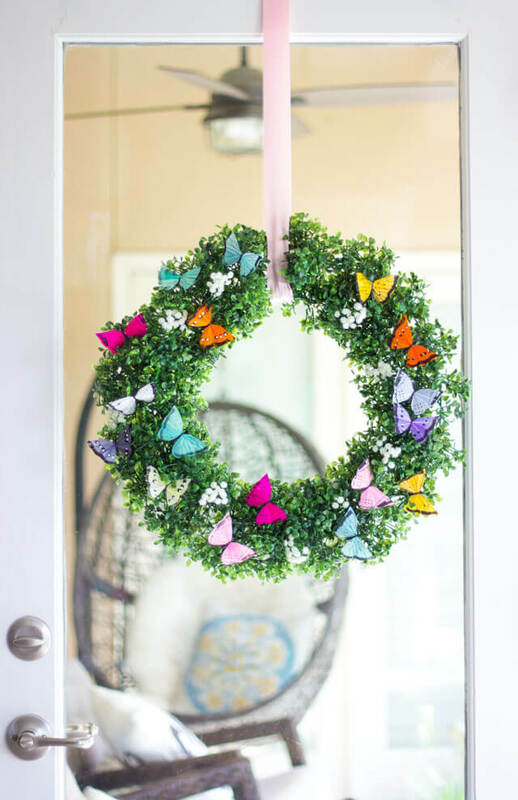 The various colors of the butterfly’s wings make this wreath eye-catching and perfect for every season to be hung up. The soft green leaves and little flowers complete the picture as something wholesome and not to be disturbed. You can hang this anywhere with a ribbon. 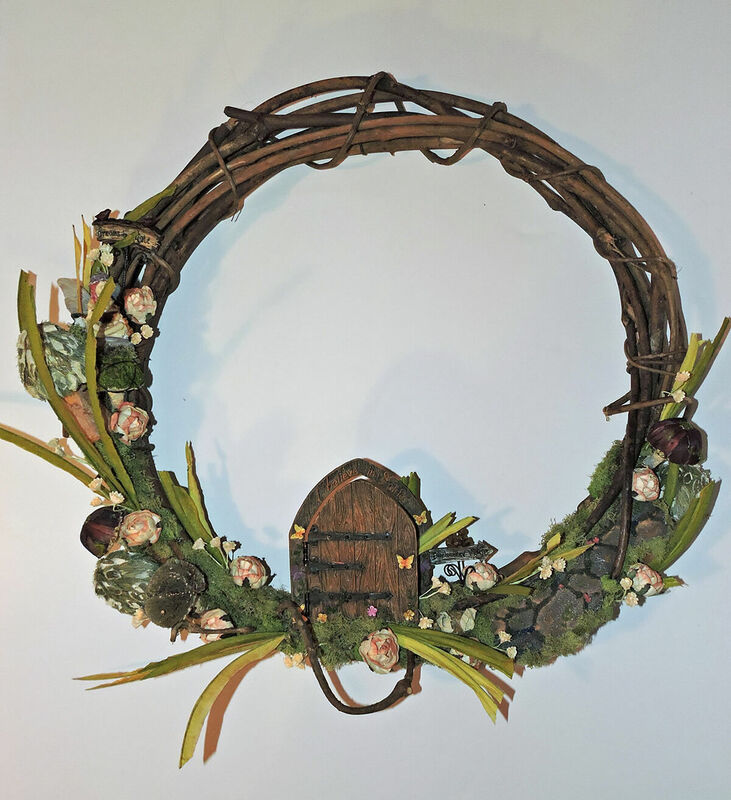 To make sure fairies are happy with your home and garden, you can encourage their good mood by giving them a little place to stay in your wreath. That’s just what this wreath provides with its cute little window and picket fence. The mossy green makes the wreath look rich and healthy. This is perfect for any wayward fairy. Strong is the power of a fairy ring. A fairy ring inside of a fairy ring though? Extremely powerful. You can use this power to welcome your guests to your home. A small scene is displayed with the fairy ring and arch at the front and center. 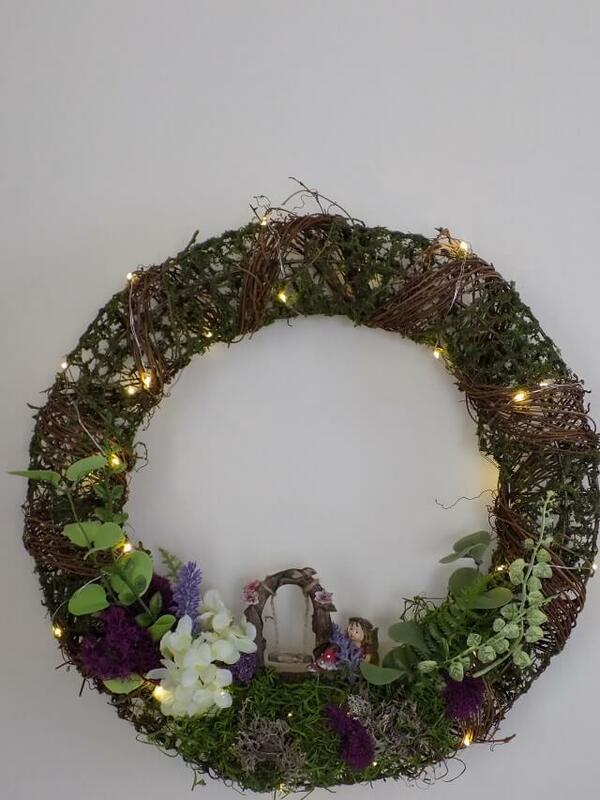 Lights are carefully arranged around the wreath to encourage soft and peaceful atmospheres. This beautiful arrangement displays playful dragonflies and butterflies that almost look as though they’re about to leap from the wreath and settle on your shoulder. Little nests filled with eggs are also nestled within the safe and healthy greens of the wreath. 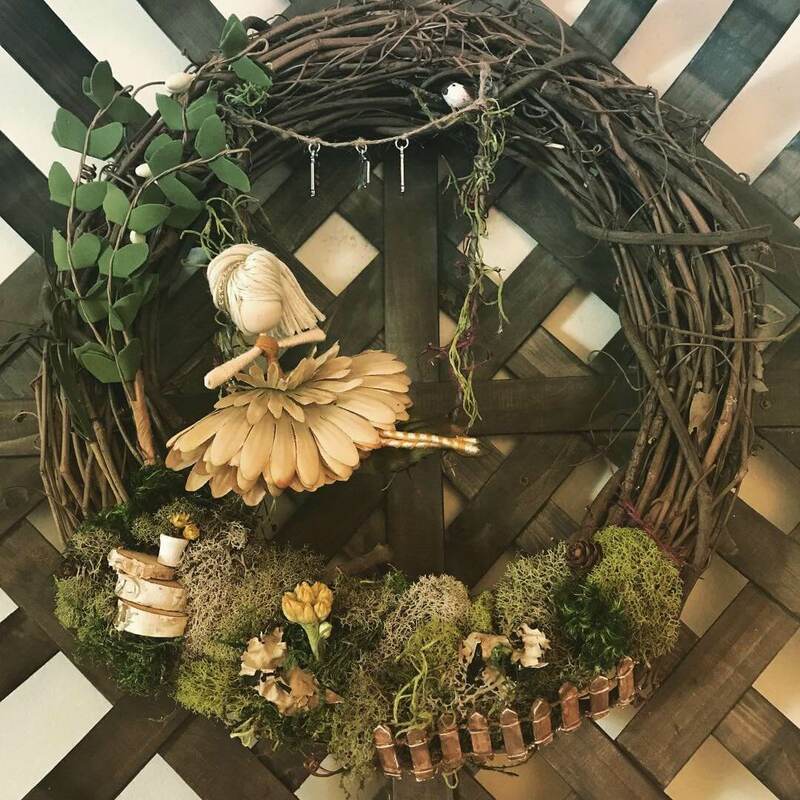 The use of wooden twigs and sticks speaks to the earthiness of this wreath and forges a connection with nature. If the idea of gnomes and fairies frightens your child, then you may want to go for something more child-friendly like bringing in the animals of the woods instead. That’s what this wreath intends to capture. It uses cartoon versions of a friendly fox and raccoon to welcome little ones to their garden. Messages can be written to further invoke welcome. In keeping with certain color schemes, you can make your fairy wreath perfect for any season. The use of red, as in this wreath, brings to mind the season of Fall. The season is greeted warmly by a happy gnome that rests at the bottom. Large red flowers give this wreath an extra color boost. This playful wreath idea uses bright and beautiful flowers to cover most of the wreath. The array of colors brings to mind health and flourishing beauty. 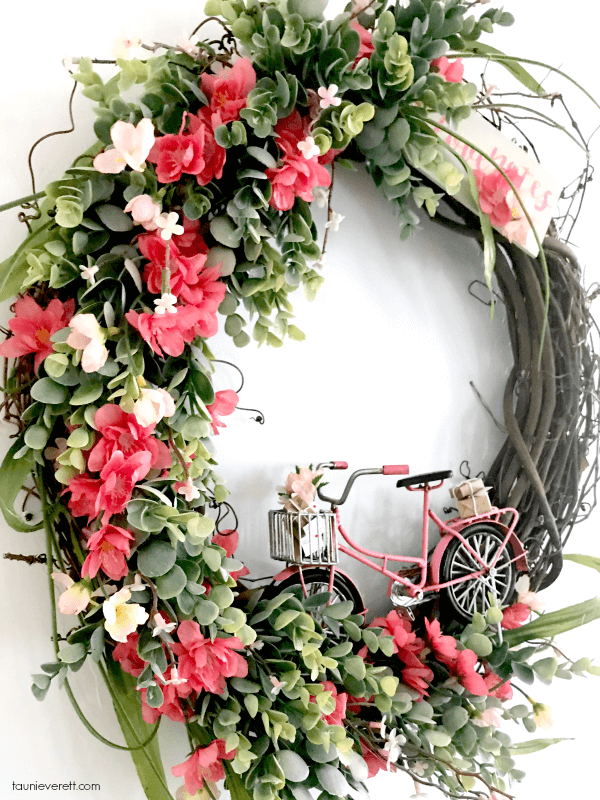 It is with the use of the small bike that turns this wreath into something more than just a beautiful display. The bike is perfect for any fairy or gnome to use. To really nail the aesthetic on the head, you can include a wooden sign that points the way to said fairy garden. That’s what this wreath idea does and also includes a small fairy that is using the wreath as her own personal swing. This keeps the wreath playful and friendly. Ornate flowers can add beauty to the wreath. A cool play on the wreath is to forgo the use of leaves or branches to form the wreath and just stick with wood. This wooden frame in this example makes an earthy connection immediately. It also helps the fairy at the bottom, who is surrounded by flowers, pop out to the forefront. This wreath is simple and elegant. If you’re interested in your wreath looking more authentic and organic as though you picked it up off of the ground, then you may want to consider this idea. The tangle of branches is carefully arranged just enough to form a ring. Nestled in the bottom are moss and woodland creatures. Flowers further add a bit of color to make this wreath exciting. Some of the best wreaths are those that don’t quite look like a wreath but clearly are. That’s what this wreath manages to accomplish with its flourishing flowers and leaves. There’s a lot of movement in this wreath that makes it look as the vegetation sprouted in this formation organically rather than was made. The wooden sign offers warm greetings. 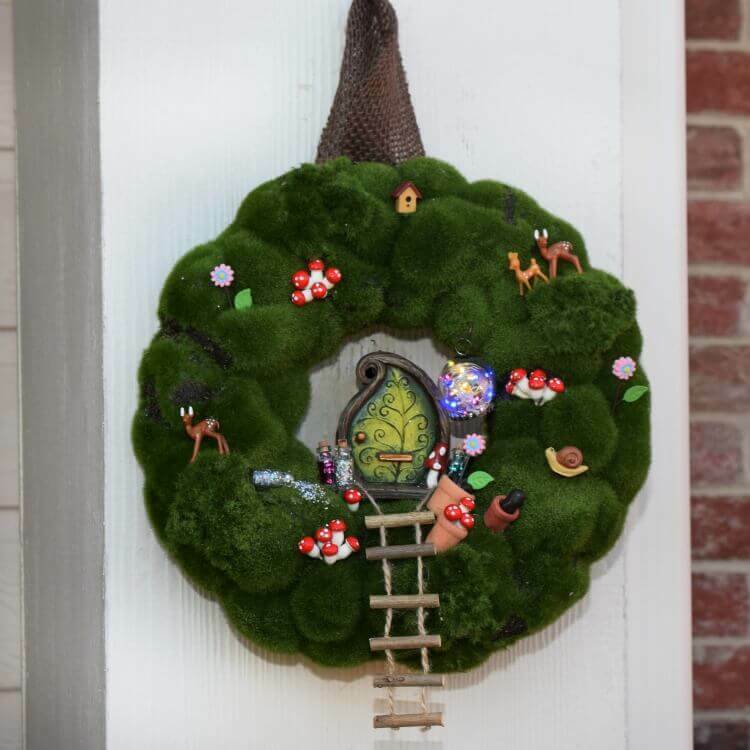 In keeping with some of the more popular fairy garden motifs is this wreath with an abundance of toadstools. The stools are vibrant in color and pop quite pleasantly against the healthy green of the wreath. 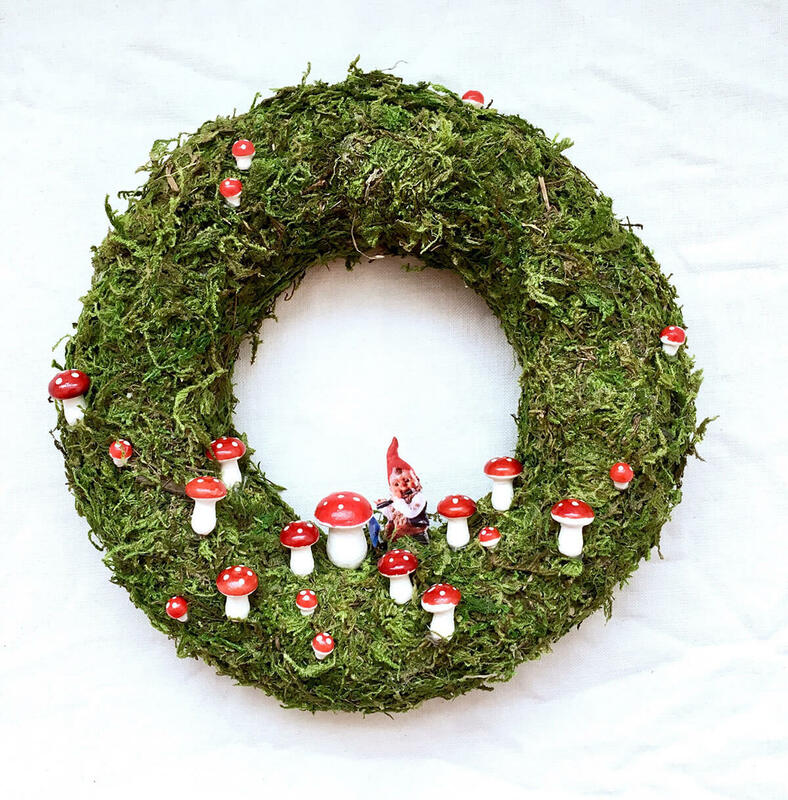 The inclusion of a happy gnome sitting among his toadstools makes the wreath playful and fun. Children will love spotting him in there. Another way to tie in your fairy garden with Christmas is to include a happy elf. They’re basically part of the same family. 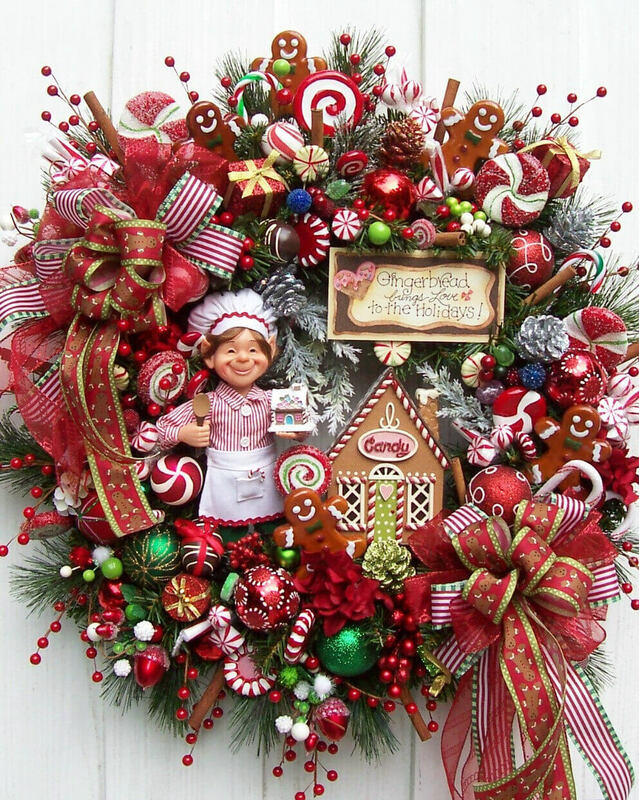 This wreath is loud with its Christmas cheer and contains wonderful imagery. Gingerbread men, candy canes, beautiful bows, and that happy elf all work together to proclaim the home’s love for Christmas. Every fairy and gnome needs a door to their abode. 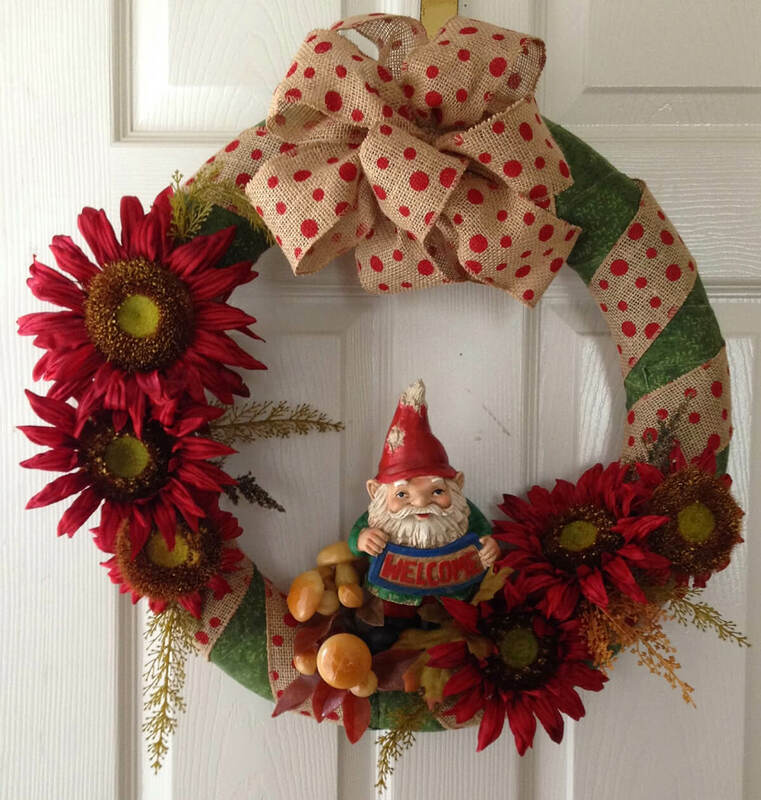 This wreath features just such a door where gnomes can enter and rest after a long day in the garden. Two of them rest in this wreath, slumbering and relaxing happily. Little birdhouses and pots are cute little features placed within the healthy wreath to complete the tranquil scenery. The beautiful and flowering fairy takes center stage in this wreath. She floats above the mossy green at the bottom of the wreath and offers her protection for your garden. Everything about this imagery invokes exactly what a fairy garden wreath should look like. From the use of wood, moss, and to the inclusion of a watchful fairy, it all comes together. This is another beautiful wooden wreath that uses a simplified build to garner elegance instead. The main focal point here is the old gnome door at the bottom of the wreath. It is perfectly situated to welcome all fairies, gnomes, and humans through its door. 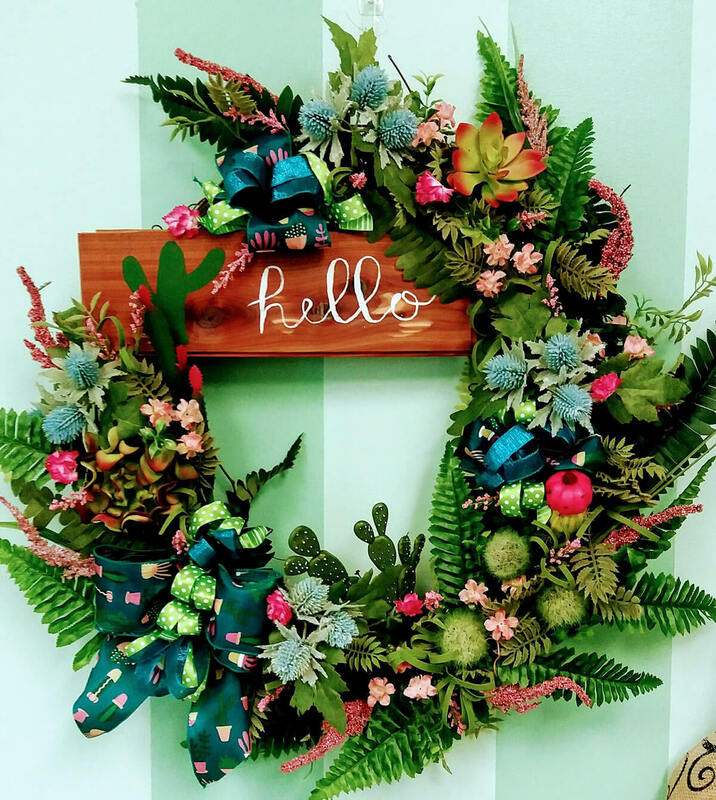 The use of leaves and stems along the wreath further increases its beauty and connection to nature.